In early February, our Chief Pharmacy Officer Jerry Buller and Chief Solutions Officer Tony Zappa led a Becker’s Hospital Review webinar about how health systems can overcome barriers to grow world-class specialty pharmacy programs. Research shows integrated health system specialty pharmacies improve adherence and patient outcomes, yet health systems face challenges to entry and program growth. Jerry and Tony addressed this important topic by giving attendees a framework to evaluate opportunities for acceleration and expansion. 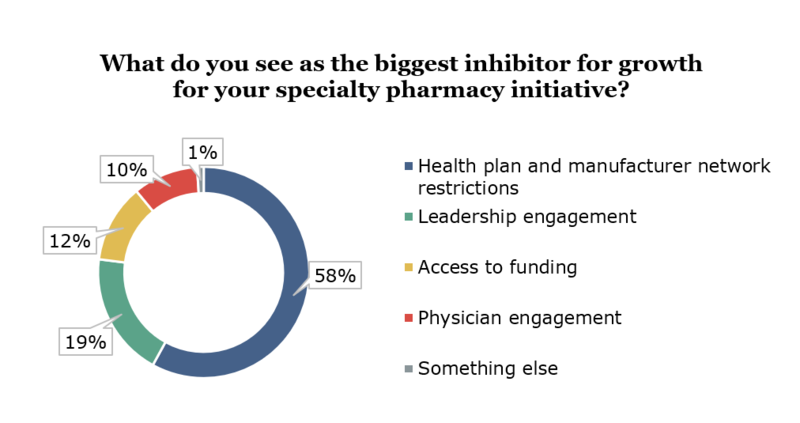 We surveyed webinar attendees to learn what they see as the top obstacles for their health system’s specialty pharmacy programs. The graph below shows the results — unsurprisingly, top challenges included gaining health plan and manufacturer network access and leadership engagement. Webinar attendees asked many compelling questions about specialty pharmacy market dynamics, business planning, and other topics. Because Jerry and Tony didn’t have time to answer every question during the event, we have provided a comprehensive Q&A below. We hope you find it helpful and encourage you to reach out to Jerry or Tony with any additional questions. Miss the webinar? Click here to watch the recording and download the presentation. Are health systems in general looking to only service their own patients with their Specialty Pharmacies (patients treated by a health system-affiliated physician), or do you see health systems taking on community or national pharmacies for non-system affiliated patients and Rxs? In our experience, health systems are very much focused on improving the experience for their own patients. Their focus is squarely on managing those patients more effectively and leveraging specialty pharmacy services to provide more holistic, more complete services to those patients. The predominant care model today creates gaps that a health system-centric model eliminates. This is proven to benefit all stakeholders – patients, health plans, manufacturers and the health systems themselves. It is the rare exception in our experience when a health system looks to compete beyond its traditional service area. Do you think that the National Specialty Pharmacies are creating barriers with the Payers to keep IDN Specialty Pharmacies out of the channel? Not intentionally, no. Health plans have proven willing to allow health system specialty pharmacies into their networks provided those health systems can demonstrate value and alignment around cost of care and patient outcomes. As health plans, PBMs, and specialty pharmacies become more vertically integrated that dynamic may change but we don’t see that happening intentionally now. Once a specialty pharmacy is up and running, what are most clear advantages and disadvantages compared to independent specialty pharmacies? The published literature demonstrates that health system specialty therapy programs that feature pharmacists embedded in clinics for patient engagement provide both clinical and patient satisfaction/loyalty improvements over other care models. The model is demonstrated to improve adherence, cure rates, and re-admission rates. An article on the subject can be found here.This model also creates higher satisfaction for clinic staff and particularly for physicians whose workflow is improved and who now have a trusted partner in the care process around complex therapies. Given the largest specialty pharmacies are owned by health plans and PBMs, what incentive do they have to work with hospital-owned specialty pharmacies? How can health systems overcome these barriers to gain access? Is it just scale that matters? Where health systems can demonstrate alignment with health plan goals and in particular where they are taking risk for patient care then health plans have demonstrated a willingness to allow access to their networks. This is particularly true when a health system specialty pharmacy can prove a demonstrable reduction in cost of care. Health plans in our experience focus locally and market by market, so massive scale is less important than alignment with plan goals in specific areas. Are health system specialty pharmacies largely limited to dispensing those drugs that are covered under pharmacy benefits? Can one expand into drugs covered under medical benefits through “white-bagging”? What are the barriers to competing with specialty distributors or GPOs supporting “buy and bill”? Typically health system specialty pharmacies focus on patient-administered medications and those covered under the pharmacy benefit. However, more and more we see a willingness to apply processes and practices learned there to areas like infusion. Many health systems already have those centers established but struggle with processes like revenue cycle management. The discipline learned in specialty pharmacy services around prior authorization for example can certainly be applied successfully in these areas too. Can you share an example of where network access was negative and as a result of the Specialty Pharmacy engagement it led to favorable access? There are many examples of positive access with the health system leaders in specialty pharmacy. That said, the largest health systems and academic medical centers have worked hard for a long time to gain that access. It can be challenging for a regional or community health system to drive access. For an example of positive access, download our case study here. Are there any organizations Health System Specialty Pharmacies can work with towards establishing payer contracts? In our experience health plan engagement is a local activity and therefore there is little advantage to a national or regional organization aggregating health system outcomes as there can be with manufacturer access. We work locally with our customers to leverage their results and their health plan relationships to drive access and ensure the specialty program is directly aligned with health plan goals and objectives particularly around cost of care. What do you recommend are the best ways to get health plans and PBMs on board to obtain access to networks? In our experience health plan engagement is a local activity that requires a focused strategy methodically executed over time. There is no “quick fix” here – it requires a thoughtful approach that will evolve over a period of months if not years. We work locally with our customers to leverage their results and their health plan relationships to drive access and ensure the specialty program is directly aligned with health plan goals and objectives particularly around cost of care. How do you work with your providers and other specialty pharmacies to get true limited distribution products to the patient? Is there is a listing of such drugs? Access to limited distribution drugs, like health plan access, requires a focus on data and outcomes as well as the ability to leverage local relationships. Additionally, partners like Trellis Rx can help on a national level. Ultimately, the health system specialty care model aligns very well with manufacturer’s goals and objectives particularly around effective utilization of medications and ongoing adherence monitoring and outcomes tracking. Practically speaking, manufacturers will typically require accreditation as well. There is no comprehensive list of limited distribution drugs available, but partners like Trellis Rx can help you identify those that require attention as you engage in development of your specialty pharmacy business planning process. Do you think there’s any chance that the acquisition of Celegene will change the LDD position for Revlimid and Pomalyst? This remains to be seen but we don’t anticipate any changes in access opportunities here in the near-term. What are your top 2-3 sources for benchmarking data and or how do you identify pharma/payer expectations? Do you have workload statistics to benchmark against for more mature programs? Unfortunately there is not a good industry-wide repository for health system specialty pharmacy benchmarks. We have developed our own benchmarks over time for our customers relative to dispensing operations, clinical practice standards, and ongoing specialty growth and would be happy to discuss those in the context of your specific situation. Do you see any regulatory changes on the horizon that might impact health system specialty pharmacy? There are no regulatory changes that will impact specialty pharmacy directly. There are, however, two items that could affect specialty pharmacy indirectly.First, CMS is contemplating changes in how PBMs calculate direct and indirect remuneration fees (DIR fees). Currently, specialty pharmacies can be hit with large post-adjudication take-backs if they don’t meet certain qualitative standards set by PBMs, including generic substitution rates and adherence targets for chronic diseases. Because of the types of drugs specialty pharmacies dispense, they often have no way to meet these targets. The changes in DIR fees may mean better targets, plus fees will need to be calculated at the point-of-sale (meaning no retroactive take-backs). These may result in considerable savings for specialty pharmacies.Second, HRSA has been hinting at changes to 340B contract pharmacy programs for several years. Of note, they may place limits on the size of contract pharmacy networks, either in number (say, fewer than 10) or geography (such as a 5- or 10-mile limit around the covered entity). If such a limit was implemented, health system-based specialty pharmacies may be able to capture prescriptions that are now being referred to outside pharmacies. Health systems that are 340B-eligible could, in turn, capture more savings that would allow expansions of patient care and hiring of additional providers (expanding clinic volumes).